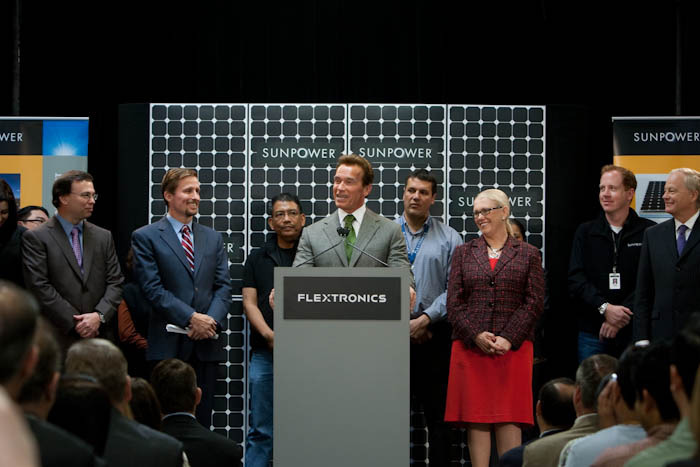 Governor Schwarzenegger celebrates Earth Day From left to right: Flextronics President E.C. Sykes, SunPower Chief Executive Officer Tom Werner, Governor Arnold Schwarzenegger, Labor Workforce and Development Agency Secretary Victoria Bradshaw and Milpitas Mayor Robert Livengood. Today, Governor Schwarzenegger joined SunPower Corporation and Flextronics in Milpitas to celebrate the 40th Anniversary of Earth Day and announce that SunPower has partnered with Flextronics and will locate its new manufacturing operations in California. Click here to read more. The above photo was taken at Flextronics in Milpitas, California. Today 190 countries are celebrating Earth Day, over a billion people around the world are celebrating Earth Day.This is a very, very important day. But even though we can celebrate I don’t think we should sit on our laurels, because there’s a lot of work that still needs to be done. I do not accept a future in California where we have every sixth child in the Central Valley go to school with an inhaler. I don’t accept that we have so many people, because of pollution, die. More people are dying because of pollution than of car accidents. I don’t accept that kind of a future. I don’t also accept a future where we rely on fossil fuels. So this is why what we are doing here and what you are doing is so important. I will do everything that I can, while I’m in office and even after I’m finished with this job, to fight for the environment and to fight for alternative fuels and to fight for solar and renewables and all of those kind of things. So we’re going to go and work together for many more years to come, because it’s all about follow through. You know, what they teach you in sports, when you do the golf, follow through. In tennis it’s about follow through. In skiing it’s about follow through, making the turns and finishing your turns. And the same is also with this. I get a lot of my lessons from sports because you can really learn some really good lessons. So it’s all about follow through, so we’re going to follow through. About SunPower. When I started in 2003 we had 35 employees and $6 million in revenue. Today we have over 5,000 employees and over $1.5 billion in revenue. We manufacture and design the world’s highest-power density solar system, the world’s highest.If you buy a SunPower system you know it’s going to work. You also know that you’re future-proof. You know the technology isn’t going to be obsolete. I have a system on in my house; it’s already paid for itself. SunPower is building with PG&E one of the largest, if not the largest, solar farm in the world down in San Luis Obispo. So this is really extraordinary. Again, it will put the spotlight on California because of the great technology we have here. It’s one thing to set goals with AB 32, to say we’re going to reduce our greenhouse gases by 25 percent by the year 2020. But how are you going to get there? Only through technology — only through technology. Because I don’t believe that people should stop anything. I don’t believe that people should stop with their Jacuzzis or with their flat screen TVs, (Laughter) or with driving big cars and flying the planes. No, we’ve just got to change the technology, that is the most important thing. And that is technology that’s being developed right here by SunPower. You make it possible that we will have one day renewable energy — renewable energy, 33 percent of renewable energy — only because of this kind of technology. So this is why I am so excited about it. You each spoke about technology. From time to time, technology needs a little push to get it to the next level and if it doesn’t get that push it may die or maybe it’s slow to get there. If the special interests push me around I will push back. That’s exactly what we’re going to do. We’re going to push back and we’re going to go and keep our great environmental laws in place.